Happy Chanukah! We have had a fun weekend with all sorts of festive activities. 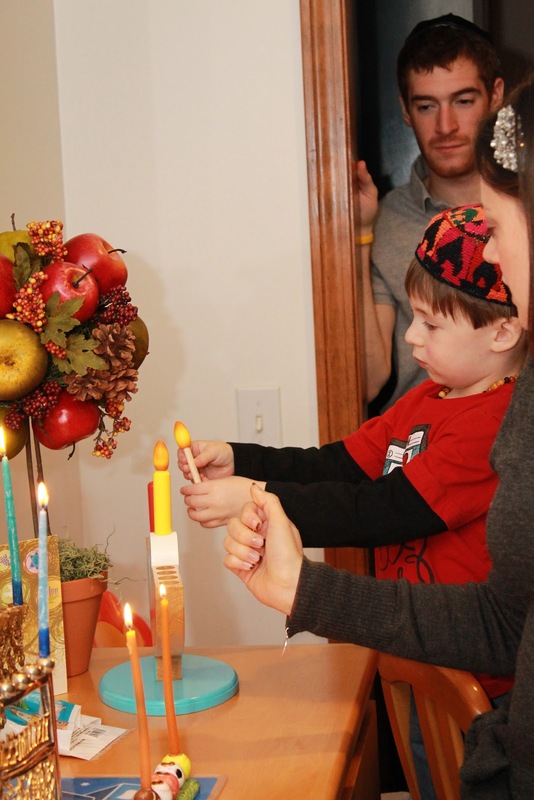 Zayit and Ziva enjoyed their first night of Chanukah with their grandparents. They made out - as if we need anything else for these kids, but they were quite happy. I had made a large felt Christmas tree for Zayit and Ziva to decorate and redecorate and I felt like I needed something special for Chanukah as well. Enter the large felt menorah. This one took a little longer to cut out, but in the end, I'm liking it. Tonight Zayit put the second candle on and 'lit' it as well. He even got to "light" his own menorah! He was so proud of himself! Christmas is coming! That's what Zayit is saying these days... "Christmas is coming to Zayit's house." It's so cute. He thinks that Christmas is an actual person and in a couple weeks someone will show up on our doorstep named Christmas. It's so hard to explain to him that it's just a day and not a person. Too cute. This weekend is our "decorate the house" weekend and I thought it best that I have some decorations for the Littles to play with. I had seen a similar idea to our felt Christmas tree on Pinterest and I decided this was a must-do/must-have. So far, it's been a hit. 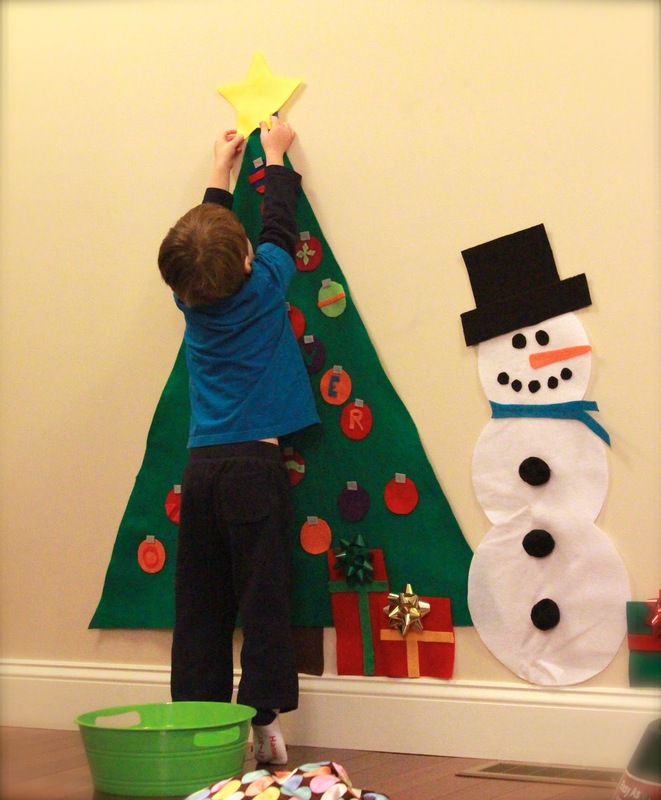 Zayit can decorate and redecorate the tree over and over. There are ornaments with letters on them, some plain and some with squiggly lines. This was so simple to make. I bough a yard of green felt and cut a giant triangle. The star, ornaments and presents are cut up from felt squares and I used a glue gun to attach everything. I stuck some wrapping bows onto the presents to add some dimension. The snowman is also felt with pom pom buttons. I had initially thought this would be a great way to count down to Christmas by adding a new ornament each day, but I quickly realized that it would get much more play if I made a bunch of ornaments and left them out for open play. So far so good! 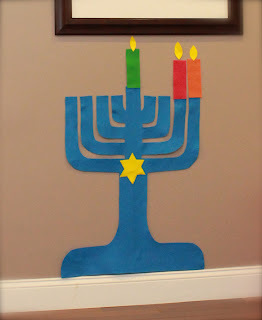 I'm hoping that I will have enough time to do a giant felt menorah tonight! Wish me luck and enjoy your holidays. I'm always trying new and creative ways to get food into Zayit's belly. This idea has been all over Pinterest lately, so I decided to give it a try. I was pleasantly surprised when it worked! I hope that when Ziva starts on solids that she isn't as picky! Zayit is showing a ton of interest in learning to write these days. 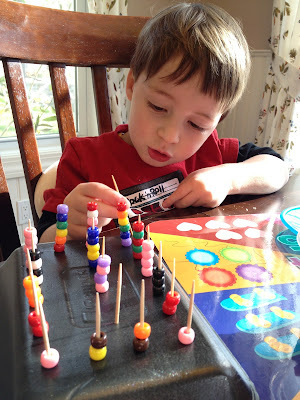 He still has a lot of practicing to do and needs to gain some better fine motor muscle control. 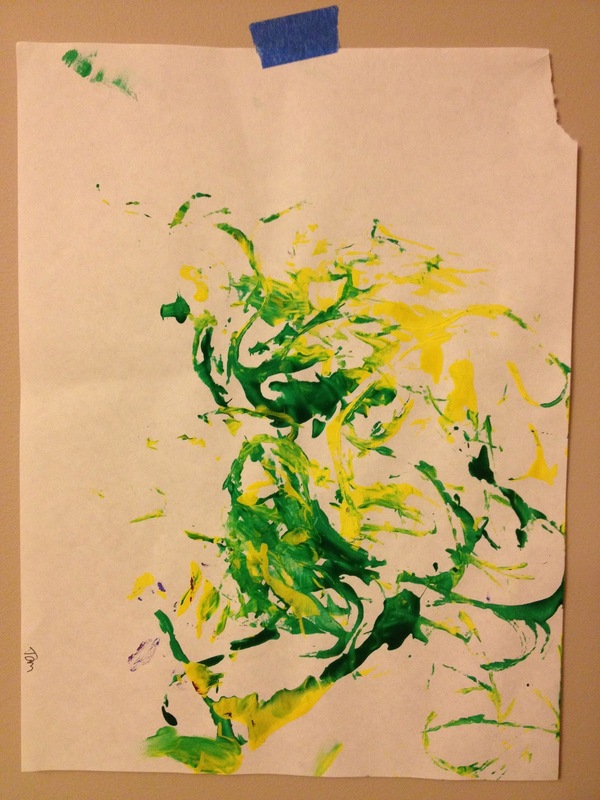 He is doing phenomenally well and can write a somewhat legible first name! Here is one of the recent fine motor activities we have done. It was so simple yet he loved it. I kept the setup on the table for a couple of days and he would play with it during his meals. He eventually started moving the toothpicks around too. What you need: toothpicks, foam tray from meat packaging and beads. 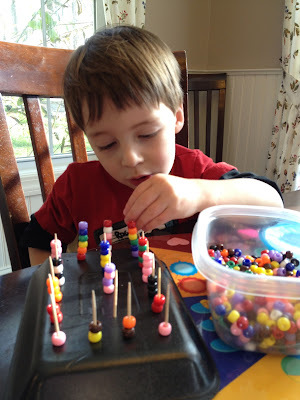 Not only did this help with fine motor, but colors and counting were reinforced as well. I've been away from blogging recently. I had a little too much on my plate for a bit between work and family, illness and even an ER visit. All is well now. But not to fear... although I haven't been online, we have still been having a ton of fun! This time of year is so much fun. We've already had a snow storm - the first for Ziva and the first for Zayit to really get out there and enjoy. Zayit was so excited to put on his snow gear (a pleasant change from last year when everything was such a struggle.) We went sledding in our yard and made a snowman. Who knew it was so difficult to make a snowman! 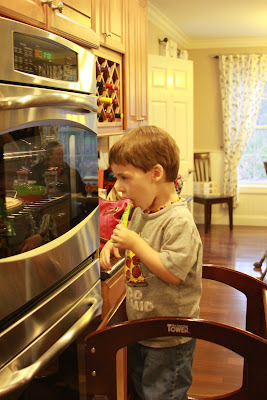 Zayit hadn't had kitchen 'playtime' recently, so this past weekend I decided to make cookies. Zayit loved it. 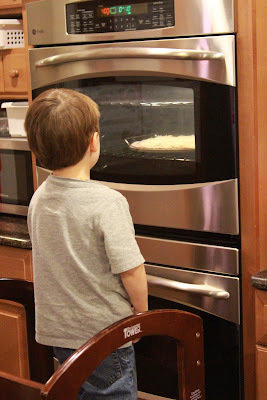 It became a 2 day affair, starting with mixing the dough Saturday morning. (as a side note - I initially intended to use pre-made dough, but I was completely put off by the list of ingredients in all the pre-made options!) The recipe I used turned out really yummy. Scroll down to the bottom if you want to use it as well. We put the dough in the fridge during nappy and rolled it out in the afternoon. He was a stellar helper with rolling the dough and pressing the cookie cutters. 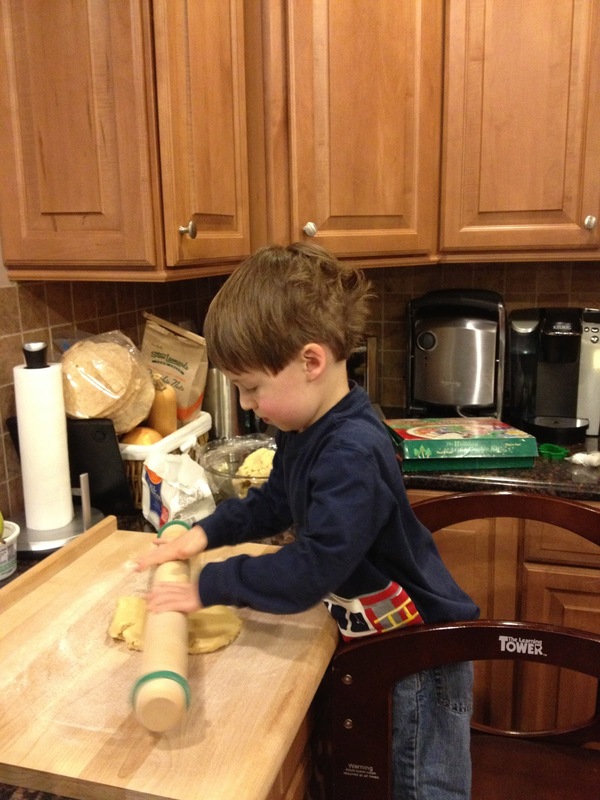 Even Daddy got in on the fun rolling out the dough! I cooked the cookies that evening and they were completely cooled and ready for decorating by morning. I made 3 colors of icing in addition to white (red and green for Christmas cookies and Blue for Channukah) and had them ready to go in pastry bags. 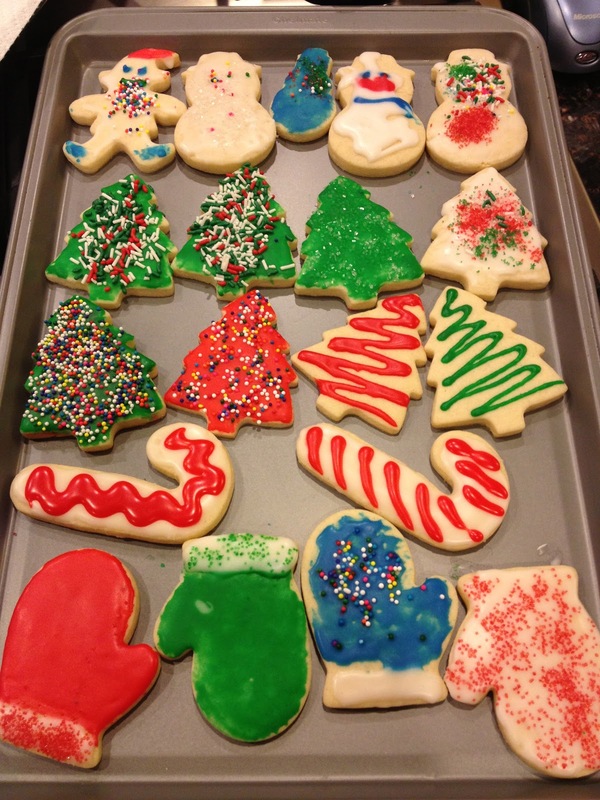 I also put various sprinkles and colored sugars into silicone muffin cups and provided spoons to sprinkle on the cookies. Mommi: "Zayit, the frosting goes on the cookes"
Zayit: "No Mommi, I'm just eating it!" Whip together butter and sugar, beat in eggs and vanilla. Stir in the dry ingredients and chill until somewhat firm. Roll out and bake 7 minutes at 400 degrees. Yummy! I found that the thinner cookies were a bit crispier than I prefer and started rolling them out a bit thicker - maybe 3/8" thick. The frosting is just confectioner's sugar and a little milk. Life has been crazy busy... Mommi was sick for about a week, then Thanksgiving, and now both Zayit and Ziva are sick. Ugh. But in all the germs and family festivities, I finally found the time to order our holiday cards. Yippee! Now, if only I can get them in the mail before the holidays are over! Wish me luck. 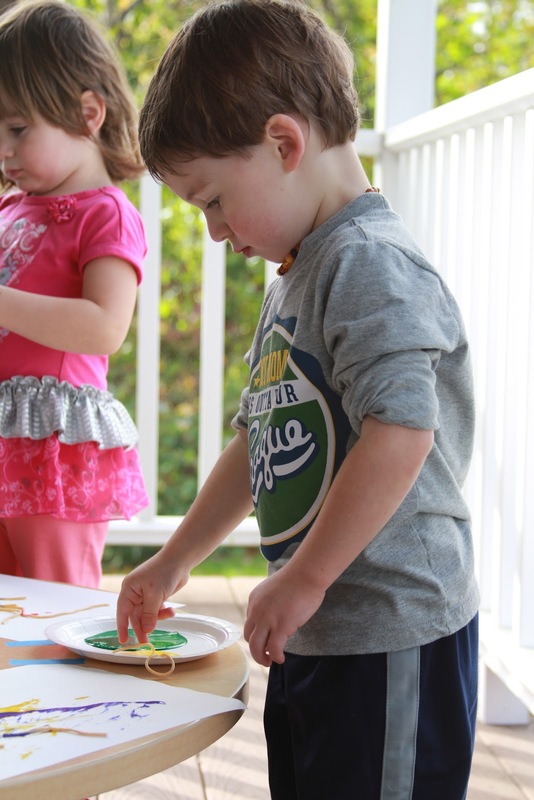 Enjoy the next couple of weeks with your families and remember to have lots of fun! 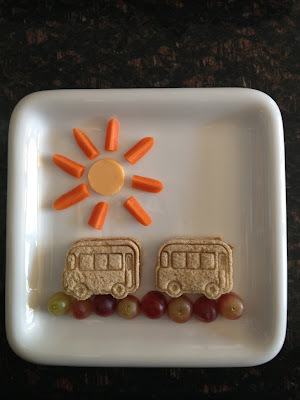 School bus turkey sammies, grape cobblestone road, cheese sun with carrot rays. Ziva is getting older (9 months!) and I thought it was about time we did something just for her. While Zayit was napping, Ziva got to try her hand at finger painting. 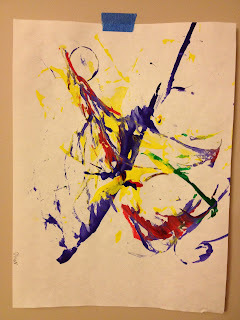 It was a very new experience for her in many ways - she was allowed to mess with the 'paint' on her tray, it was cold and slimy, and a new taste for her. Fun times! I'll admit that she was less than thrilled at first but in the end, it was a fun experience. Since everything goes directly into Ziva's mouth, the paint needed to be edible. I found some great ideas on Pinterest and decided to go with vanilla pudding. Hmmm.... Feels.... COLD! WET! SLIMY! We had a bunch of colored pudding left over, and since we don't really eat that sort of thing in our house, we will be using it in the bath tomorrow night so Zayit can enjoy as well! We use pom poms in our house quite often. 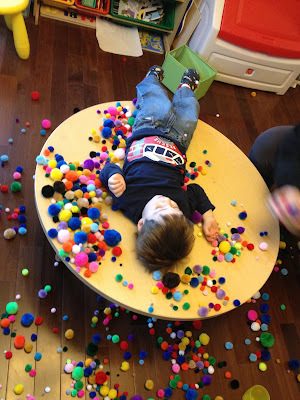 We started when Zayit was about 18 months old with a simple busy activity of stuffing pom poms through a hole in the top of a small container. Such a simple activity, but I have gotten hours of quiet time over the last year or so. He even takes his little container in the car with him. We count pom poms, sort pom poms by size, sort them by color, glue them to paper plates, use them for crafts... we do a lot with them. 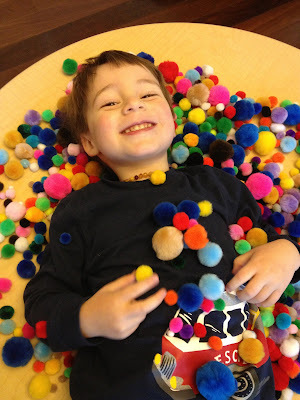 Recently we were running low, so I ordered a BIG bag of pom poms. They arrived today! What a fun sensory experience! I think he likes his new supply of pom poms! I have come to terms with the fact that Zayit is a terrible eater. He isn't picky... he just doesn't eat certain food groups, such as meat or protein. He is great at gobbling up veggies and fruits, but try and get some sort of protein in him, and I'm out of luck. The only protein that he will consistently eat, and it's not a great source, is dairy - yogurt, cheese, etc. I don't usually complain much because he would rather have a red pepper than an oreo... in fact, he will take a bite of an oreo and then hand the rest to me! 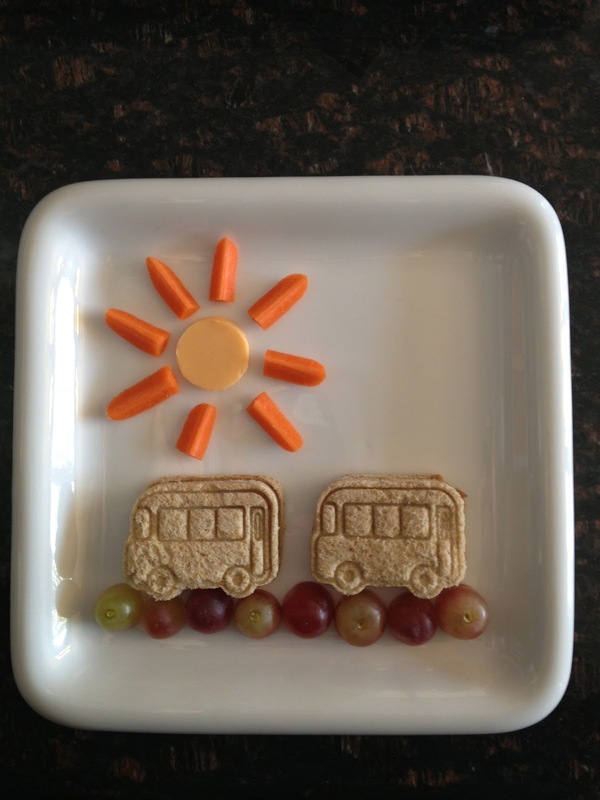 His meals are usually a collection of different raw veggies, fruits and yogurt. The only "main" dishes that he will force dow (and I hate to admit to this) are mac & cheese, pizza, chicken nuggets and grilled cheese. So frustrating. 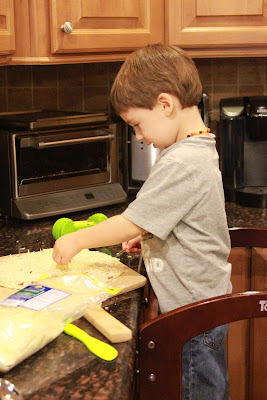 This week, we made some homemade pizza. I was able to snag a few pictures of him enjoying the process. We had a lot of fun and he ate it! I felt a little better knowing what was in the pizza he was eating instead of the typical pizza he consumes. 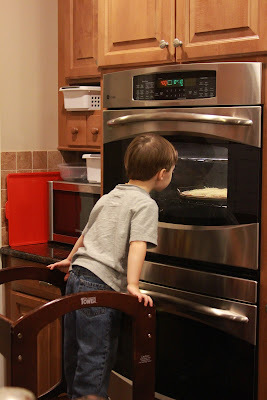 I will definitely be doing this again... maybe even attempt to include some veggies on his pie next time! He was so excited to eat his "by himself" pizza. He stood in front of the oven for the entire 11 minutes that it took to cook! Hurricane Sandy has come and gone. We were lucky and did not lose power, but we are all feeling a little cabin fever. It was nice enough that we could spend some time outside today. It was still windy, but pleasant. 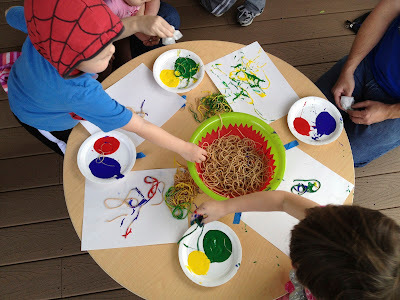 Zayit wanted to play with some friends, so we called the neighborhood friends and invited them over for some messy play! 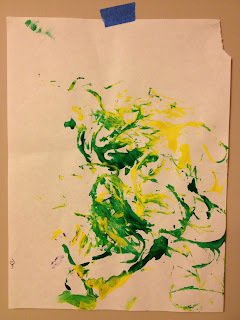 Spaghetti painting! 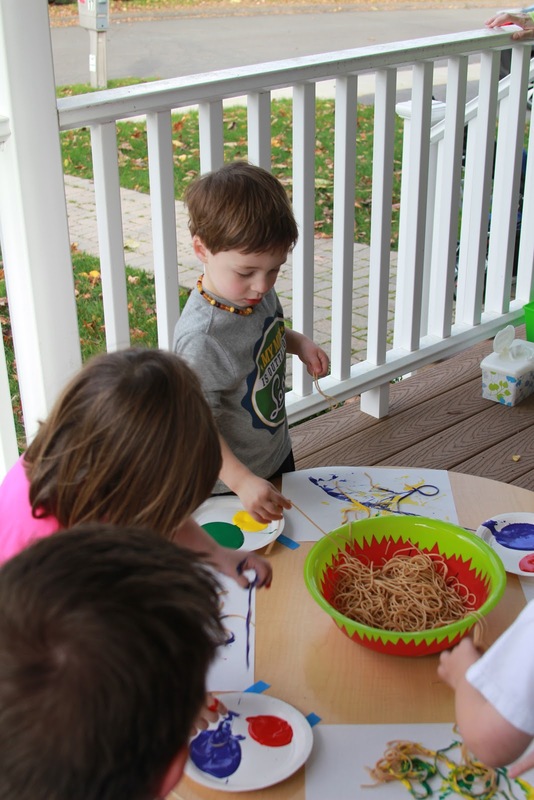 I initially set up the table in the playroom, but thankfully, I rethought that and put everything out on the porch instead. I am SO glad we did this outside. It was VERY messy! Paint was all over the place. Spaghetti is just as messy to paint with as it is to eat. One of the cool and unexpected outcomes of making squirrel food was that Zayit actually ate peanut butter! I've been trying to get him to eat peanut butter for a LONG time. Who has a kid that doesn't like peanut butter and jelly sandwiches? Me! I'm so excited that he broke through that barrier. I even pushed it tonight and threw a few squares of a peanut butter sandwich onto his dinner plate... and HE ATE THEM!!! YIPPEE!! Thank you squirrels! 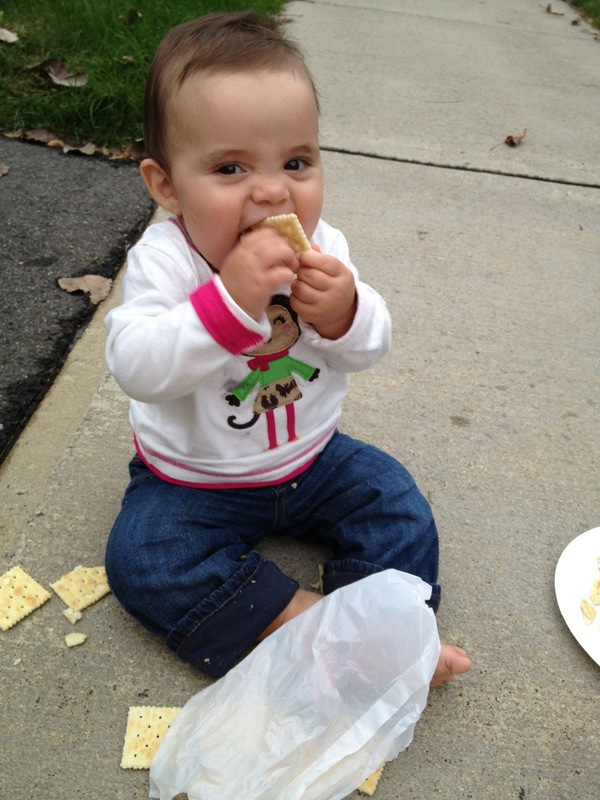 Ziva had her first cracker too. She thoroughly enjoyed it. 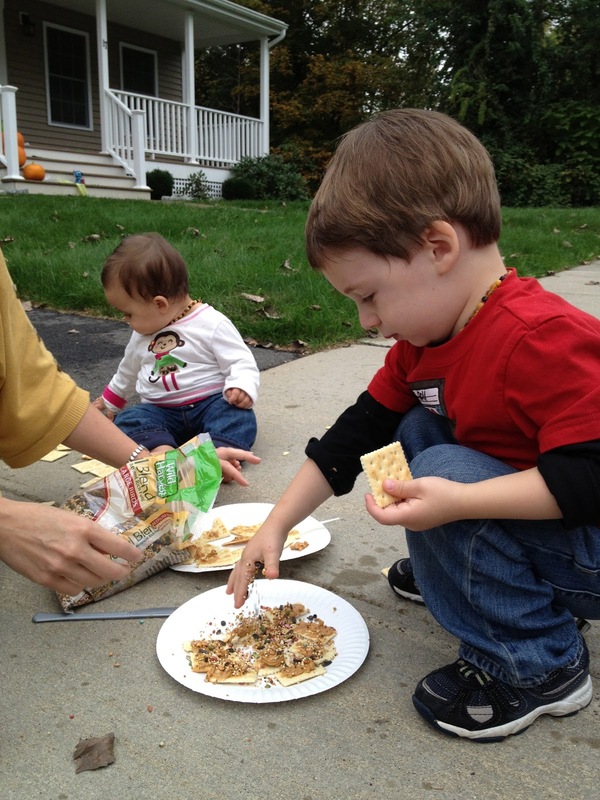 I think I have one picky eater and one who will eat anything! They are 27 months apart and 7 pounds apart. Hmmm. After we spread the peanut butter on the crackers, it was time to sprinkle the bird seed on top. We headed out to the island across the street and found a good spot under a tree to leave the yummy goodies. Zayit pointing to where the stash is left and waiting for the squirrels to come and dig in. After about an hour, we were able to go back outside and see a couple squirrels enjoying their find.